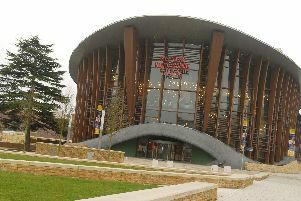 Pantomime is not just for Christmas – as the Grove Theatre in Dunstable is setting out to prove next month. The venue is hosting a panto for the Easter season on Tuesday, April 10, at 2pm and 6pm. Beauty and the Beast stars comedy favourite Bobby Davro and CBBC’s Tracy Beaker, Dani Harmer, in what promises to be another fun-filled Easter production. Audiences can expect a star cast, impressive music and energetic dance routines as well as plenty of jokes, slapstick and heaps of audience participation, from the same team behind last year’s hit The Wizard of Oz. Enchanted Entertainment’s production for Easter tells the story of Beauty who longs for romance and adventure, a bad-mannered Prince who is transformed into a Beast to teach him a lesson and a good Fairy who makes both their dreams come true. There will be spectacular magic, dazzling production numbers and, of course, jokes galore for all the family. Davro made his television debut in 1981. In 1983 he made his TV breakthrough at Live from Her Majesty’s followed by appearances on the television show Copy Cats. Between 2007 and 2008 he played Vinnie Monks in the BBC One soap EastEnders, participated in Dancing on Ice in 2010 and took part in Your Face Sounds Familiar in 2013. Call 01582 60 20 80 or visit grovetheatre.co.uk to book.